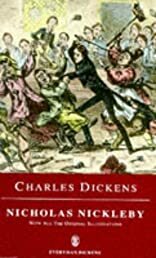 The Life and Adventures of Nicholas Nickleby, Part I. The Life and Adventures of Nicholas Nickleby Part II. One of a series of classic novels. About David Parker (Author) : David Parker is a published author. Published credits of David Parker include Before Their Time: The World of Child Labor and Nicholas Nickleby (Everyman's Library). About Michael Slater (Editor) : Michael Slater is a published author and an editor. Some of the published credits of Michael Slater include The Christmas Books (Penguin Classics), Our Mutual Friend.